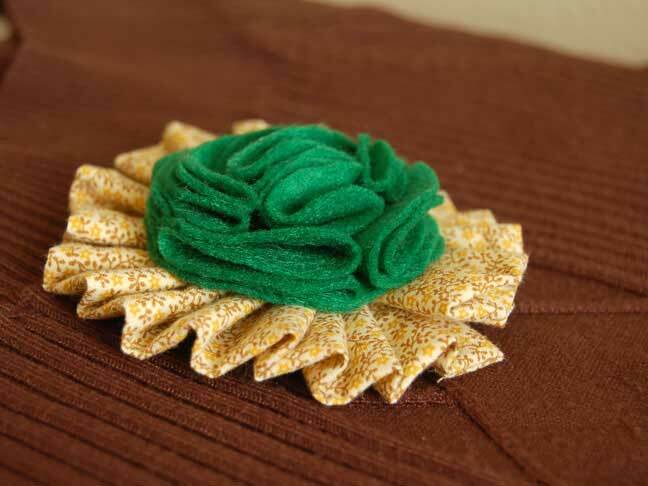 What would St. Patrick’s Day be without this sweet, vintage inspired, ruffle flower brooch? 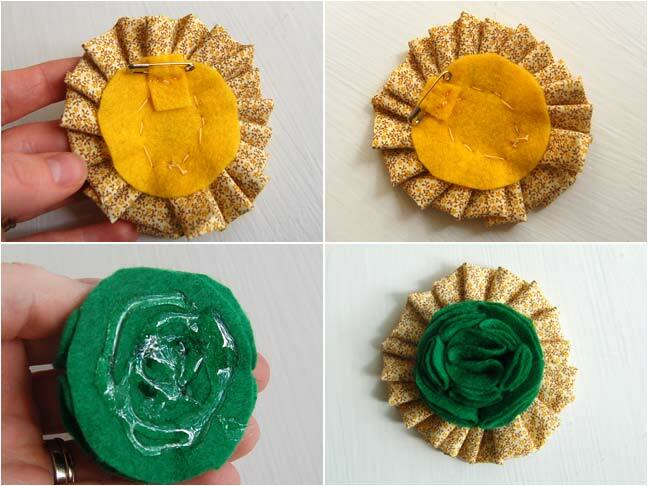 Cut circles out of felt with the following sizes: 5 – 1.5 inches in diameter, 6 – 1 inch in diameter. 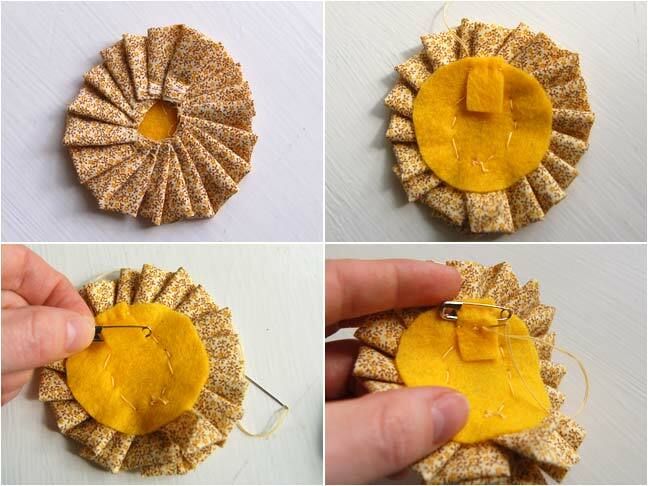 Lay a 1.5 inch diameter piece of felt down for the flower backing. For the next 4 pieces, fold in half 2 times and hot glue to the backing piece. Do the same for 5 of the one inch diameter circles. 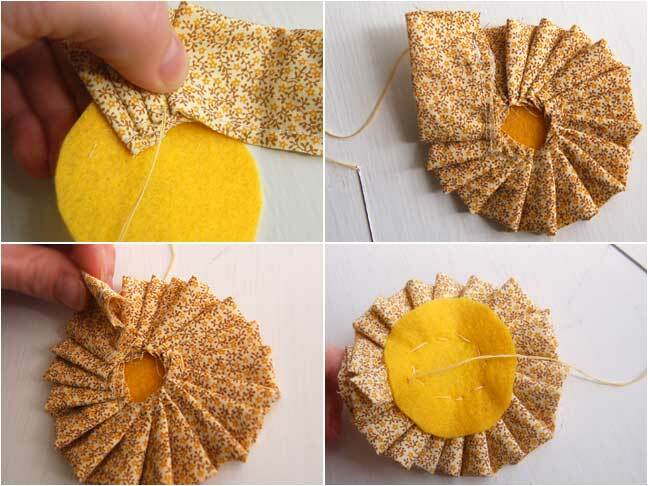 Fold the last one in half 2 times and hot glue with the point facing down. Cut a piece of cotton fabric 2 inches wide by 24 inches long. Fold in half lengthwise, right side out, and pin in place. Sew along the edge. Thread a needle with matching thread and tie a knot at the end. Cut a circular piece of felt 2 inches in diameter. Pass the thread through the felt circle one time. 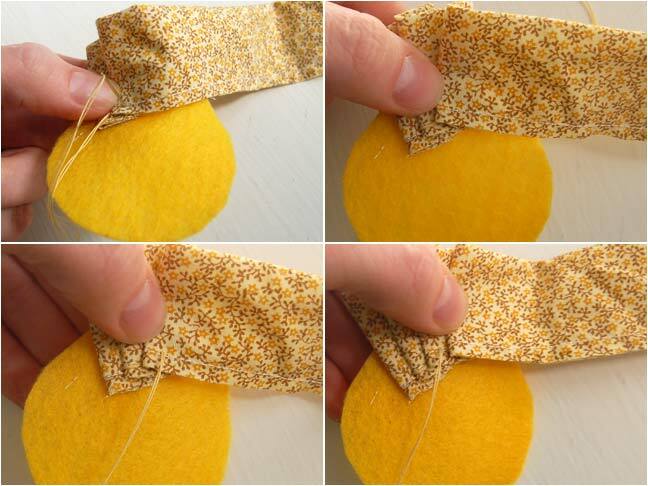 Fold one end of the fabric under and stitch it to the felt circle. Fold the fabric again. Stitch the second fold onto the felt circle. Fold the fabric again and stitch in place. 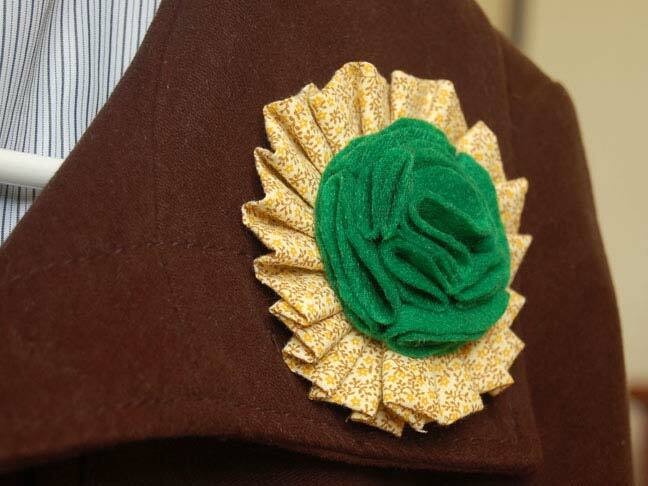 Continue the folding and stitching process until the entire edge of the felt circle is complete. Fold under the edge before stitching the last fold in place. 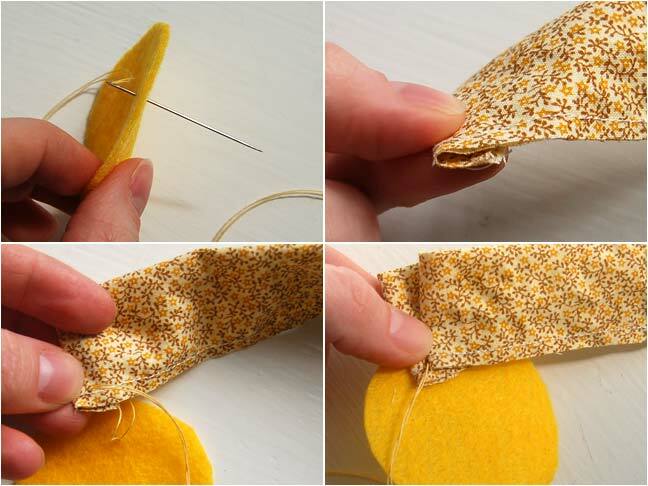 Tie a knot on the back of the felt to secure the stitch. 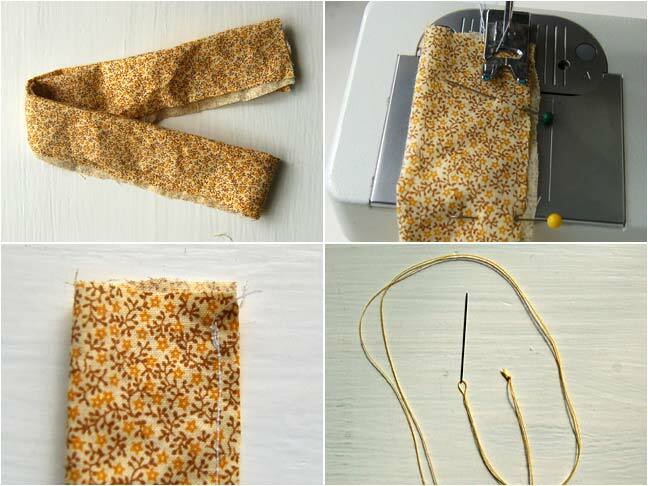 Cut a small rectangular piece of felt to contain the safety pin. Stitch the top of the small felt cutout near the top of the back of the brooch. Insert the safety pin. Stitch the bottom of the small felt cutout and tie off to secure in place. 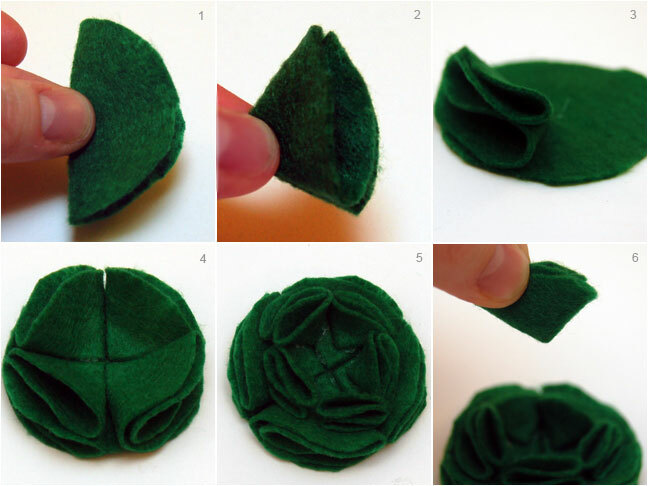 Use hot glue to attach the green felt flower to the center of the fabric ruffle. So sweet don’t you think? Find more St. Patrick accessories here and also here.